Extensive usage of APRO CRM or a large number of CRM users can sometimes produce the following effect: each user is getting involved in too many system events, which results in piles of incoming notifications. 2 — adjust the filter. We also introduced a new communication panel with shortcuts to conversations with users you recently had. 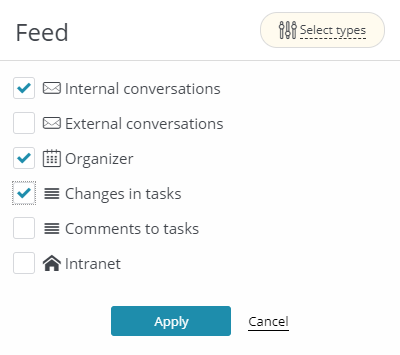 The panel displays links to recent internal and external chats, the most dynamic and recently changed tasks, the number of missed calls and emails, etc.